This unique metal sign holder with wood base is part of our Hanson Industrial Piping Collection. This sign holder features a metal 7"x11" card frame that can be pivoted vertically or horizontally, adjustable height, and wood base. The wood base has a stained finish with natural wood variations. 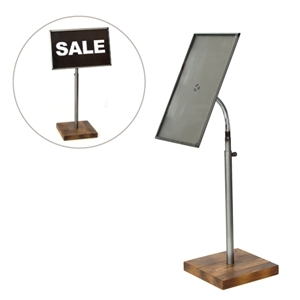 Perfect for displaying sale signs or product information signs. • Adjustable height 19" to 28"
Disclaimer: Wood can swell, shrink and warp when its moisture content changes. Exposure to different temperatures, as well as the relative humidity of the surrounding air, can precipitate these changes and if they're allowed to occur regularly can severely hamper the function of wood.